Things do NOT look good for Bobby and Ann. There’s a whole lotta lyin’ going around in Dallas in this one, folks, and it all adds up to one very bad episode for Christopher Ewing. First up, Harris’ crazy mother Judith finds her wounded son in a pool of blood and sends the cops over to Southfork to question Ann but Bobby takes the credit for shooting Harris so that Ann’s already slim chances of reconciling with Emma aren’t further damaged by the news that her mom filled her pop with lead. Bobby’s good deed earns him a $1 million bail and his trusted lawyer warns the Ewings that Bobby’s past confrontations with Harris make the case against him very strong. Worse yet, his presence at one of those encounters prohibits him from defending Bobby! At the hospital, Judith tends to her pride and joy with a bit too much affection for comfort. She whispers to Harris that Ann will suffer watching helplessly as her beloved Bobby rots in jail. When he wakes up, he will be king once again, she promises. Weird! A frustrated Christopher tells his dad that the truth about Ann shooting Harris will eventually come to light. When Harris awakens, however, he names Bobby as his assailant, making his mama very proud indeed. John Ross decides to deal with two interlopers in his plans: Drew and his dad J.R., who is disturbed to learn from Frank Ashkani that his son is bedding down with the enemy. When John Ross says he’s manipulating Pamela for her cut of Christopher’s Ewing Energies shares, J.R. notes that his son exhibits far too much concern for Ms. Barnes’ welfare. Pammy is definitely stressed out that detectives found splattered blood in her loft and warns Frank that he has just as much to lose in this mess as she does. Frank digs up Tommy’s body in the park, where it’s found by joggers. John Ross asks Sue Ellen for a way to contact Cliff Barnes. Although she warns him about the consequences of getting involved in the Barnes-Ewing feud, she gives him Cliff’s number. Cliff, however, doesn’t appreciate John Ross’ involvement with his devilish daughter. 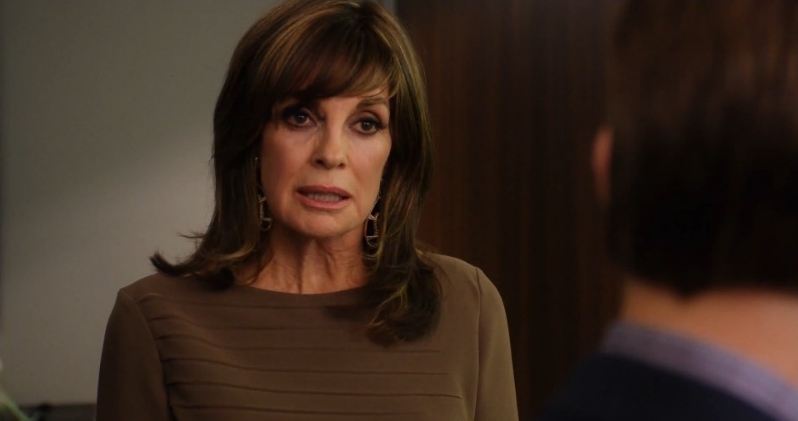 Sue Ellen warned John Ross about the consequences of crossing J.R. Still, he and Pammy are mortified to hear that Tommy’s body has been found. In a scene straight out of CSI, the cops match the bullet in Tommy’s cadaver to a gun and head off to make an arrest. Just as Pamela packs to make a fast exit from Dallas she discovers her daddy has been taking care of her the whole time and it’s Frank who’s hauled off for the murder! When Drew notices some strange drilling patterns at Elena’s Henderson rig, he fires the foreman whom John Ross bought off. Christopher catches the foreman chatting with John Ross and Ewing Energies and gets suspicious. John Ross isn’t concerned. He is, however, acting to get some dirt on Drew by setting his detective to follow him. The detective sees Drew drive off in an 18-wheeler and tells John Ross that he’s definitely up to some illegal activity. Cliff visits a remorseful Frank in jail and promises him his family will be taken care of, urging him to “do the right thing” in the wake of his betrayal of his father figure. At Frank’s hearing, Christopher arrives to witness Frank taking full blame for Tommy’s murder as well as that of Rebecca Sutter’s. As an outraged Chris protests that he’s lying, Frank kills himself by swallowing a poisonous pill. Christopher’s latest courtroom confrontation with Pamela ends in her favor, as usual. But is Rebecca Sutter really dead?